Porcelain Veneers, such as Lumineers, are an excellent way to recreate the natural look of teeth by correction of the length, width and colour of the existing teeth. Many patients at Park Place Dental have lovely smiles after having dental veneers. Mark is highly trained in the provision of veneers because they are a great alternative for teeth that have been resistant to whitening procedures as only a minimal amount of tooth enamel has to be removed to create room for the porcelain. 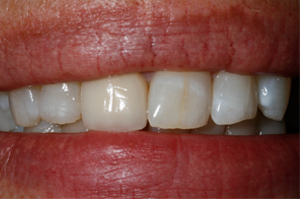 This patient had a cracked front tooth and and old bulky veneer – they have been replaced with two of the latest porcelain veneers. A smile assessment would be completed to determine if you would be a good candidate for this restorative procedure, especially if you have a habitual night grinding or clenching habit. A night guard may be recommended to protect your new smile. 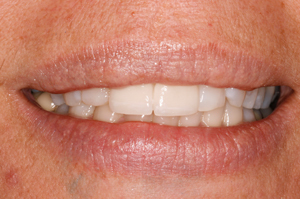 Porcelain veneers require a specially selected dental laboratory to create your custom veneers. This usually takes 2 – 3 weeks, you will then return to the office to adhere the veneers to your teeth.